Yesterday I was presented with another chance. This time the owl was sitting closer to the road. My longest tele-photo lens was actually attached to my mirrorless camera AND it was resting in my lap… We spotted the owl on the opposite side of the road. A quick turn around on the highway and backtracking to the fence post I actually made eye contact and had just enough time to focus on “the star”. I made one image and before I knew it the owl spread his wings and flew off into the distance blending in with the snow patches on the fields. 05 Apr	This entry was published on April 5, 2015 at 4:22 pm. It’s filed under Journaling, Nature photography and tagged a chance realized, an opportunity captured, bird photography, snowy owl along # 2 Hwy in SK, snowy owl up close, wildlife photography. Bookmark the permalink. Follow any comments here with the RSS feed for this post. Older: How does your fire burn? A wonderful and memorable experience and a fabulous shot. 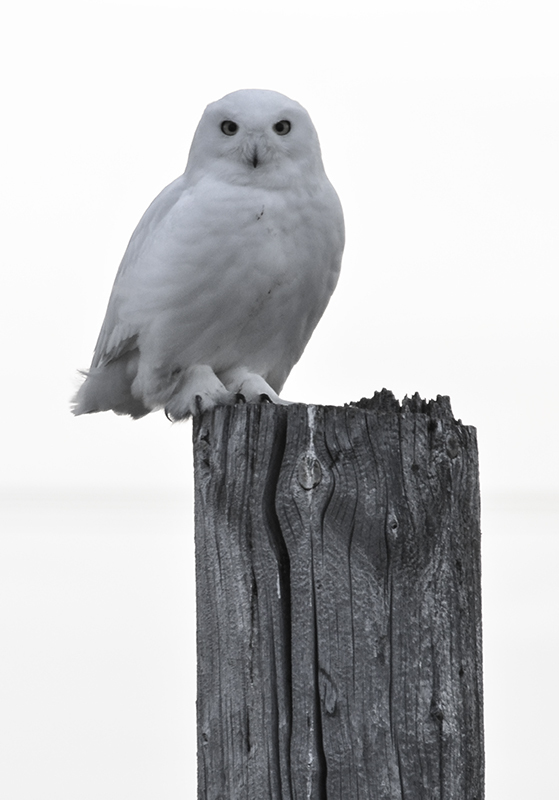 Last year while driving from Moose jaw back to Buffalo Pound, Grant and I spotted 3 Snowy Owls on power poles. We both had our cameras along and were able to get a few good shots. It was unforgettable. That’s the money shot!! The one! What a treat that must have been, thank you for sharing!! Well – not sure I would call it the money shot… it does not have enough detail of the feathers. I converted it to black and white to pull out more details – maybe next time! Congratulations Anna, I would be excited too. It would have been lovely to see it in flight, next time. Like your Quilts, it’s a prize-winning shot! Persistence pays off! Thanks, Nelly but I know that one lucky shot does not make a prize winner… Competition in SK is stiff when it comes to bird photography. That is a real treat to see your picture! My husband is impressed too. BTW, I am in your classes at QBL, first session. Will be wonderful to see you again. Linda, so good to hear from you! QBL will be here sooner than we think! He’s Beautiful Anna.What a great shot. Thanks for sharing. Thanks so much, Carol! I feel so lucky I had the opportunity right at that moment. Were you able to get a shot of the owl in flight? Great shot of the owl. I missed it flying away, it’s difficult to handle the long lens and refocus! Oh Anna, she is looking right at you and with a Mona Lisa expression is saying “Anna, I am doing this just for you”. Thank you for sharing your gift. It is a gift to me too as owls and I have a lifetime connection. I am so excited to have had this opportunity! I am still smiling!